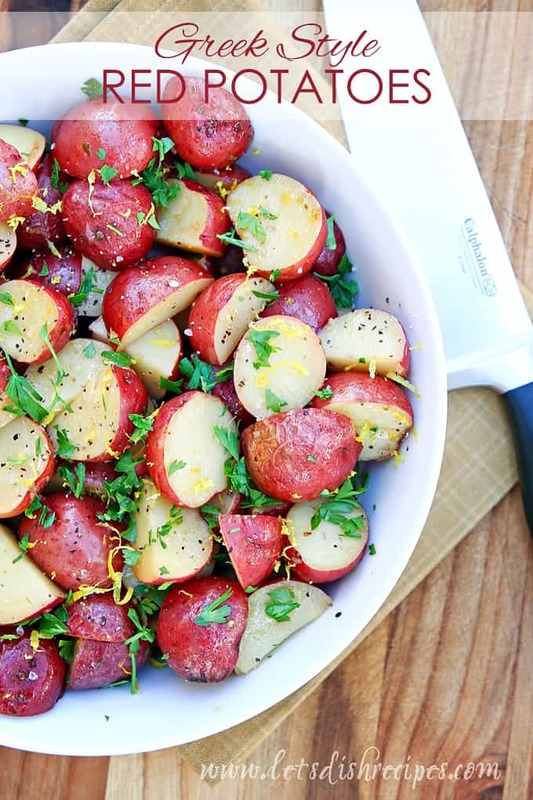 ROASTED GARLIC, DILL AND LEMON POTATOES — Roasted potatoes are tossed in a mixture of butter, garlic, dill and lemon in this refreshing side dish that is the perfect accompaniment to almost any meal. Potatoes are the one side dish I can always count on to satisfy everyone in my family. No one ever complains or refuses to eat them. So I’m always looking for new ways to serve them. And these Roasted Garlic, Dill & Lemon Potatoes were the perfect way to use all the dill I have in my garden right now. Of course I had to add some butter and garlic to the mix, along with a bit of lemon, and the results are a new favorite around here. I think I’ve made these potatoes 2-3 times in the last few weeks, and that’s really saying something because I don’t repeat recipes very often. And did I mention that I have a lot of dill in my garden? I like using red potatoes, but really, any kind of potato will do, so use whatever you have on hand. 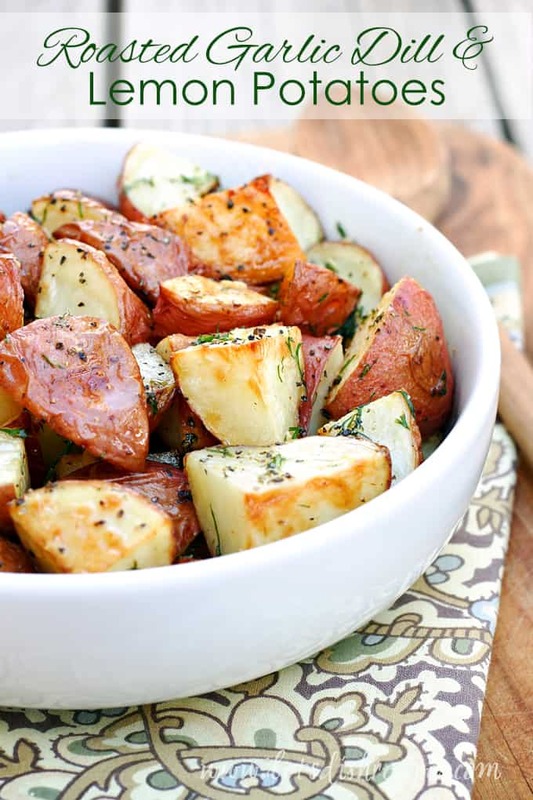 No matter what kind of potatoes you use, this side dish will be a hit! 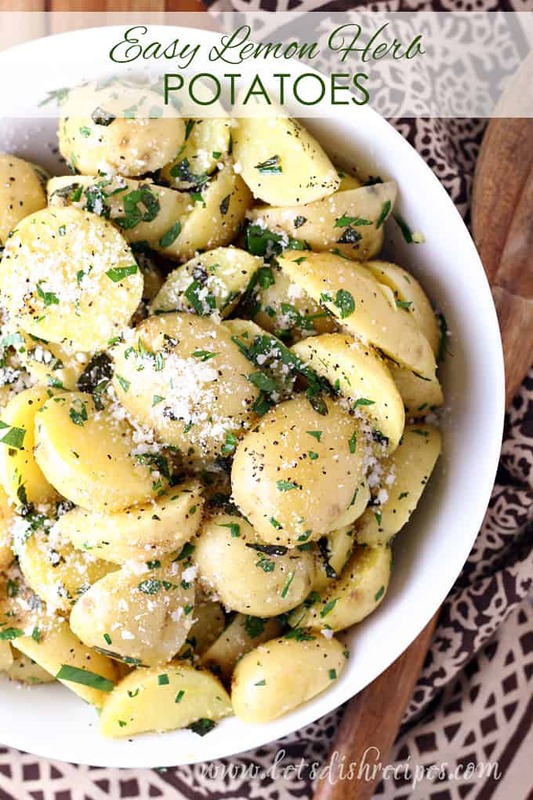 Be sure to save this Roasted Garlic, Dill & Lemon Potatoes recipe to your favorite Pinterest board for later. 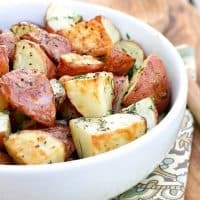 Roasted potatoes are tossed in a mixture of butter, garlic, dill and lemon in this refreshing side dish that is the perfect accompaniment to almost any meal. Preheat oven to 450 degrees. Spray a large baking sheet with non-stick cooking spray. 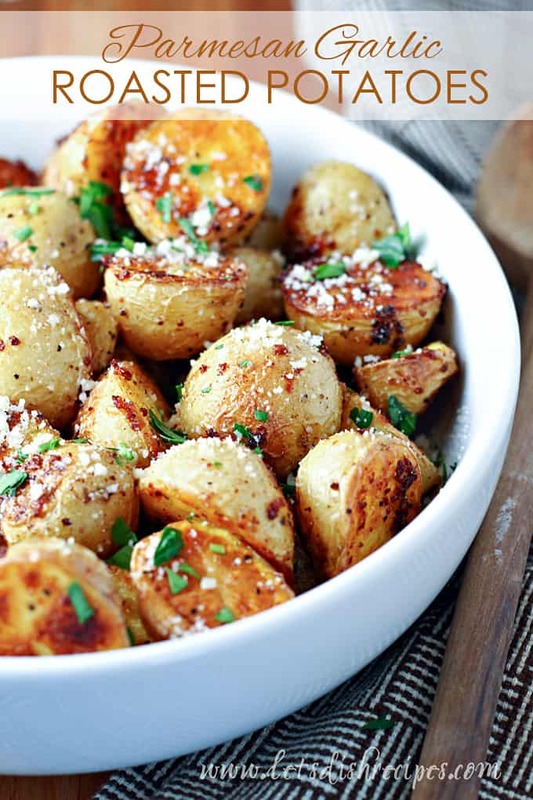 Place cubed potatoes in an even layer on the prepared pan and toss with olive oil, salt and pepper. Bake for about 30 minutes, or until potatoes are tender and golden brown. Meanwhile, stir together melted butter, dill, garlic and lemon juice. Pour butter mixture over cooked potatoes and toss to coat well. Serve immediately. I absolutely CAN’T WAIT to try these. Delish!!! Hi Danelle! These potatoes look delicious! So much dill! I love it! Hubby wasn’t a fan but that just meant more for me. These country fried home potatoes are so delicious. I definitely can’t wait to make them again. The garlic and dill are such a great choice for flavor and aromatics. Thank you a ton! I switched things up just a little bit and cooked my garlic with the potatoes. Loved the dill and lemon twist…and so did hubby! Definitely making a huge batch when all the kids are home.